The first part of Tim Churchill's 1988 hitting streak at Cypress College, Churchill could just go about his business, working to extend the streak. Once the streak got long enough for people to take notice, though, he told The Los Angeles Times that that was when the real pressure came. "I really don't want to worry about it," Churchill told The Times as his streak it 28. "I don't want it to end, but when it does, I will be relieved." Churchill's streak eventually hit 34 games before it was snapped. But, with the attention from the hitting streak, other attention apparently also came, attention from scouts. By June, Churchill was a pro, taken by the Phillies in the 15th round of the draft out of Cypress. Churchill, though, couldn't turn the momentum of that streak into a successful professional career. He ended up playing just three seasons, never getting higher than single-A. In addition to that hitting streak at Cypress, Churchill also hit .392 and knocked in 62, a school record, according to The Times. 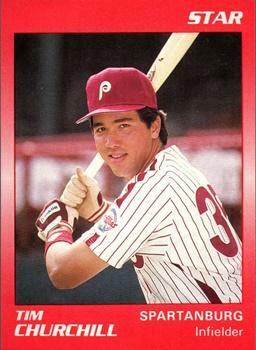 With the Phillies, Churchill started at rookie Martinsville, turning in a .239 batting average and knocking in 21 over 42 games. For 1989, Churchill split time between short-season Batavia and single-A Spartanburg. At Spartanburg, he hit just .190 in 47 games. In one June game, Churchill hit a bases-clearing double. The month before, in May 1989, a Churchill error got him the ire of his manager, Mel Roberts, and helped the game get out of hand. Churchill did win a fan with another move that month. The fan was a first grade teacher and Churchill's move was spending extra time with her class during a team visit. Churchill returned to Spartanburg full time for 1990, getting into 93 games. He also increased his average on the year to .252. But it was his final year as a pro.